In 2014 the company had about 1400 stores in 74 countries. Monsoon was started in London in 1973 by Peter Simon, a market-stall trader, and opened its first shop in Beauchamp Place in May of that year. 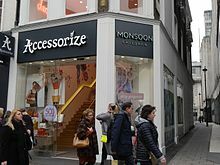 The first Accessorize shop opened in 1984, next door to Monsoon in Covent Garden. In 1994 a registered charity, the Monsoon Accessorize Trust, was set up to help under-privileged women and children in Asia. The company was listed on the Stock Exchange in 1998. In 2007 Simon paid £185 million to take it private again. In 2009 the company moved to a building designed by Allford Hall Monaghan Morris in Notting Dale. The company's collection of some 300 works of modern and contemporary art is housed there. From early 2013 to February 2015, John Browett, former head of retail at Apple, was chief executive of the company. He was succeeded by Paul Allen. In February 2013 the Forum of Private Business criticised Monsoon for requiring all new suppliers to give a blanket rebate of up to 4% on all invoices as well as a further charge of up to 10% for early payment. In October 2015 Monsoon was at the head of a list published by HM Revenue and Customs of companies that had failed to pay the national minimum wage. Because of a policy requiring employees to wear Monsoon clothes at work, the cost of which was deducted from wages, the company had effectively underpaid 1438 of its workers in the United Kingdom by over £104,000. The company was fined more than £28,000, and began paying a clothing allowance and raised wages. Monsoon is a corporate member of the Ethical Trading Initiative. In 2007 Monsoon was described as "struggling". The company returned to profitability in the following year: in the year to 31 August 2013 sales rose 4.3% to £552m and the company reported pre-tax profits of £18.1m. In the financial year to 30 August 2014, group sales fell almost 8% to £509 million, and pre-tax profits were £50m; the company announced that stores would be closed and costs cut. ^ Company Details: 01098034, Monsoon Accessorize Limited. Companies House. Accessed January 2015. NB: either the company name or the company number must be manually inserted in the relevant search field. ^ a b c d Graham Ruddick (7 February 2014). Monsoon back in the black as former Apple boss boosts sales. The Telegraph. Accessed January 2015. ^ Laura Heywood (21 August 2013). "MONSOON: Latest news, analysis and comment on Monsoon". Retail Week. Retrieved 3 May 2014. ^ a b "Monsoon - company history". Monsoon Accessorize. Archived from the original on 23 April 2006. CS1 maint: Unfit url (link) Archived 23 April 2006. ^ a b [s.n.] (26 October 2008). Peter Simon, founder and director, Monsoon and Accessorize. The New York Times. Accessed March 2016. ^ Howard Lake (5 January 2010). Money raining in for Monsoon Charitable Trust. UKfundraising. Accessed March 2016. ^ [s.n.] (29 January 2013). Christian Aid, Monsoon partnership to boost Afghanistan's silk industry. Christian Today. Accessed March 2016. ^ a b Julia Kollewe (29 September 2007). Monsoon founder wins fight to go private. The Guardian. Accessed March 2016. ^ Mike Stiff (5 February 2009). Allford Hall Monaghan Morris: Yellow, White and Studio Buildings, Notting Dale Village, London.' 'Architecture Today 198: 54. Accessed March 2016. ^ [s.n.] ([s.d.]) Top 200 Collectors: Peter Simon. artnews.com. Accessed March 2016. ^ a b Sarah Butler (18 February 2015). Monsoon chief executive John Browett to step down. The Guardian. Accessed March 2016. ^ "Monsoon Accessorize criticised for mandatory supplier rebate". PrintWeek. Retrieved 3 May 2014. ^ "Monsoon faces criticism over supplier terms". Just-style.com. 25 February 2013. Retrieved 3 May 2014. ^ Monsoon Accessorize tops minimum wage list of shame. BBC. Accessed October 2015. ^ Sarah Butler (23 October 2015). Monsoon named and shamed for not paying staff minimum wage. The Guardian. Accessed October 2015. ^ "Ethical Trading Initiative". ethicaltrade.org. Retrieved 4 March 2016. ^ Susanne Schaller (2007). The Democratic Legitimacy of Private Governance. An Analysis of the Ethical Trading Initiative. Duisburg: Institute for Development and Peace, University of Duisburg‐Essen. INEF Report 91. ISSN 0941-4967. p. 18. ^ "Monsoon Accessorize reports "most difficult year"". Retail Gazette. Retrieved 3 May 2014. ^ "Monsoon Accessorize turnover soars 4.3 percent in FY'13 - Fashion - Fashion-news". Fashionunited.co.uk. 7 February 2014. Retrieved 3 May 2014. ^ "Monsoon and Accessorize founder invests in furniture retailer Loaf". Growthbusiness.co.uk. 15 January 2014. Retrieved 3 May 2014. ^ Sarah Butler (8 May 2015). 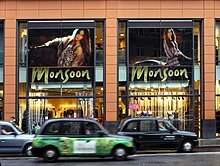 Monsoon to close stores and cut costs as profits slip. The Guardian. Accessed March 2016. This page was last edited on 13 February 2019, at 13:20 (UTC).